Oh, life is so good! 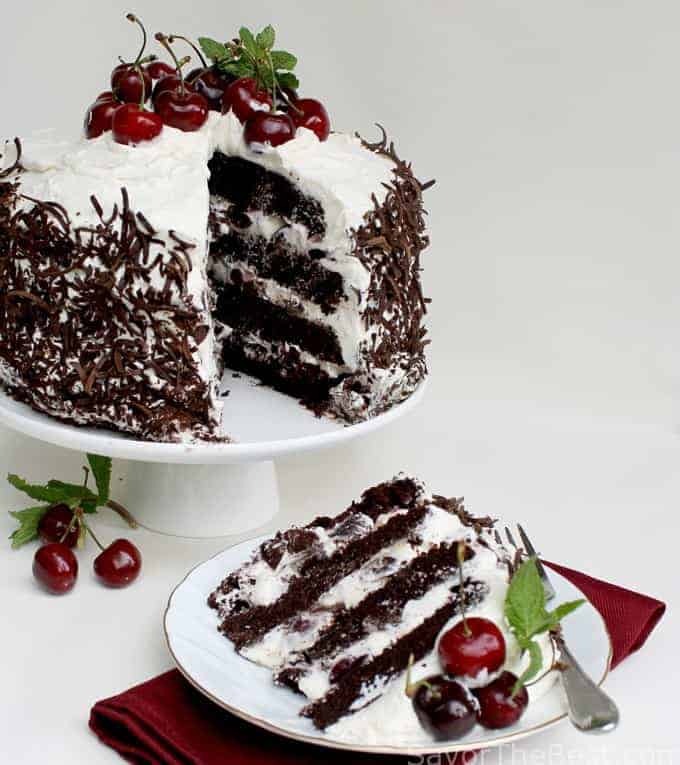 I have been waiting for these beautiful cherries to come into season so I could make this Black Forrest Cherry Cake. There is a picture and recipe in my Time Life, Cooking of Germany cookbook that I have had my eye on since February. Now is the time! 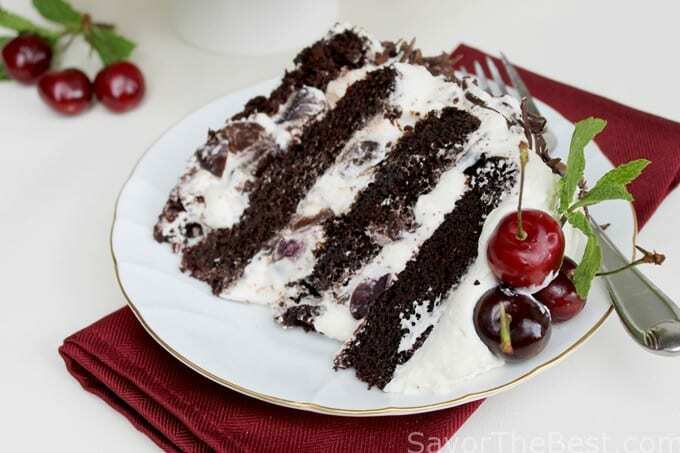 This elegant cake is so full of good flavor from the deep chocolaty cake layers that have been drizzled with a bit of simple syrup flavored with cherry brandy, which is also known as Kirschwasser. Each layer is spread with sweet whipped cream, with a little more of that cherry brandy, then studded with a generous amount of poached fresh cherries. 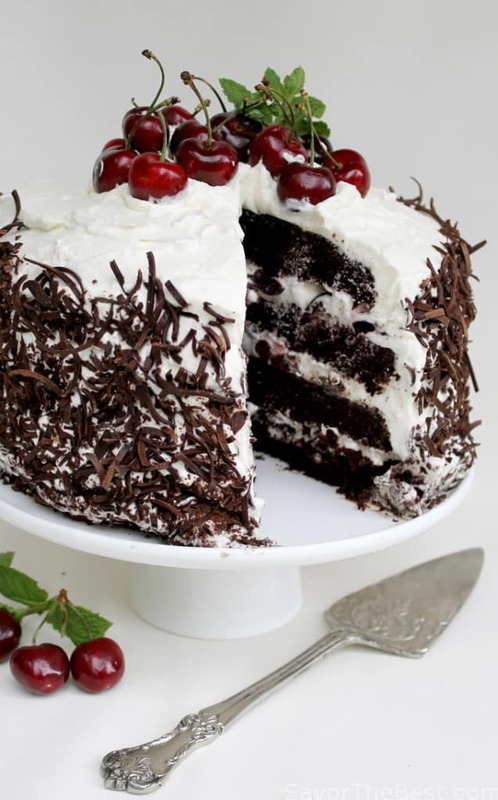 The entire cake is then smothered with more whipped cream, shaved bittersweet chocolate is added to the sides and finally, the cake is topped with fresh cherries and a sprig of mint. After reading through the recipe in the book I decided to adapt it a little. I really love Dahn’s Intense Chocolate Cake recipe, it has twice the chocolate as compared to the recipe in the book, so that is what I used to make the cake. After the cake layers cooled I cut each one horizontally giving me four layers. Pitting the cherries was probably the most time-consuming task in making this cake but canned or thawed frozen cherries can be substituted or if the fresh cherries are not in season. A simple syrup with a little Kirsch added is sprinkled on each layer. There is also a tad of Kirsch added to the whipped cream frosting so you may want to reserve this cake for adults only. Making chocolate curls is definitely not my specialty as I can never get the chocolate to be the right temperature so here I have resorted to using a handy kitchen tool that makes a good substitute for curls. This cake is very tall and because of the whipped cream it does not keep well and needs to be served the same day or the day after. 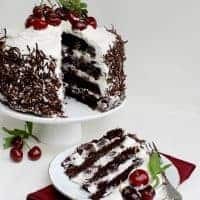 Plan to serve this black forest cherry cake at a large dinner party, as it will serve twelve easily and this stunning cake will be the highlight of your dinner. I didn’t dare keep this calorie-laden concoction at our house as it is too tempting, I could really pig-out on it and gain ten pounds overnight. Seeing as it had been several weeks since I had brought a treat to our Tuesday night bible class, I sliced off a nice size wedge and took it next door to our good friends and neighbors, Laura and Harry, the rest went with me on Tuesday night. 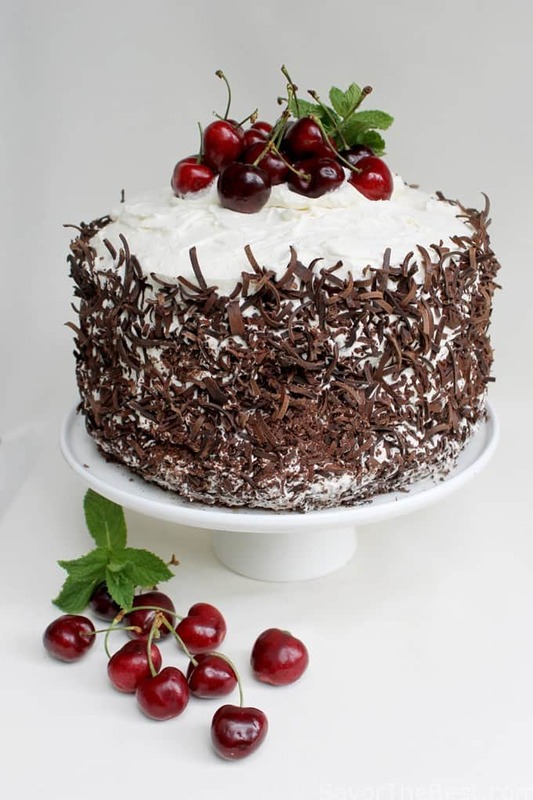 This elegant cake is so full of good flavor from the deep chocolaty cake layers, a little cherry brandy, fresh cherries, whip cream and chocolate shavings. 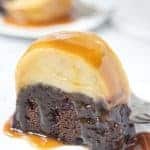 It makes a stunning dessert for your dinner guest. In a medium bowl, whisk the boiling coffee and cocoa together until smooth. Set aside. Pour the batter into the two prepared pans and place in the center of the preheated oven. Bake for 30 to 35 minutes or until a toothpick inserted in the center of the cakes comes out clean. While the cake is baking and cooling wash, stem, pit the cherries, cut them in half and reserve while preparing the poaching syrup. Add the sugar and water to a large saucepan and bring to a boil. Add the prepared cherries and bring the saucepan back to a boil again, then remove from the heat and allow to sit in the syrup for 10 minutes. 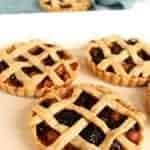 Pour the cherries through a colander and when the liquid has drained off, pour the cherries onto a plate or baking sheet that has been lined thickly with paper towels. Blot the cherries with additional paper towels to remove as much moisture as possible. Reserve the cherries until time to assemble the cake. Add the sugar and water to a small saucepan and bring it to a boil over medium heat, stirring until the sugar dissolves. Boil, uncovered, for five minutes. Remove from the heat and allow to cool to lukewarm. Whisk in the cherry brandy. Set aside. Add the cream to a large bowl that has been chilled, a stand mixer with the whisk attachment is best, beat the cream to a light thickness, sprinkle in the sugar and continue to beat the cream until stiff peaks form. Pour in the 1/4 cup of kirsch in a thin stream while the mixer is running and mix only until it is blended. Slice each layer of cake in half horizontally by placing each layer of cake on a turntable and use a serrated knife to slice through the cake as you turn the turntable. This will give you 4 layers to fill and stack. Lay the layers out on parchment paper with the cut side up and drizzle with the syrup. Place the first layer on the cake plate with the cut side up. Add a thick layer of the whipped cream and one-third of the cherries. Repeat with the next two layers and finish with the last layer. Cover the top layer and the sides with the remaining whipped cream. 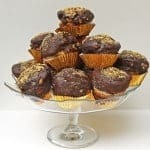 Press chocolate shavings, grating or curls into the sides of the cake. Place the cherries with stems on top of the in the center and tuck in some pretty green mint. To transfer each layer of cake after you tort it, use a thin cardboard cake board or plastic cutting board to slide under each layer. After you position it over the cake plate, push it off the board. I’m drooling just looking at the picture! 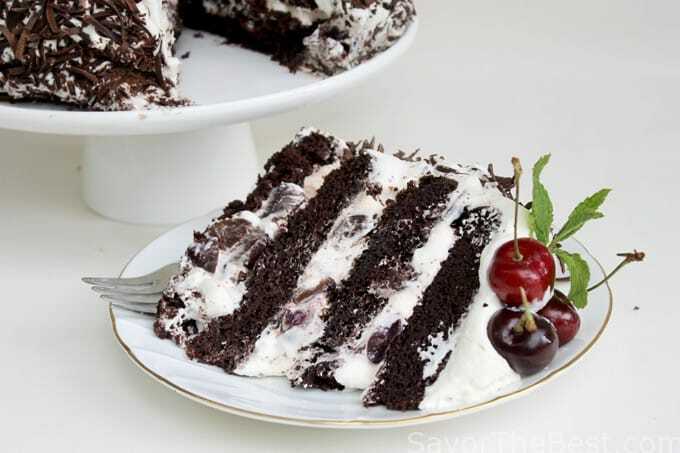 This is an amazing cake, and it has all the ingredients I love: chocolate, whipped cream, and dark cherries. I was talking with a friend about how to pit cherries and she told me about a nice pitter she has, so I’m on it. Oooh that is a gorgeous cake! I have also been super excited about cherry season. I bought some the other day with the hopes that I could make something with them, but then my children saw them and they were devoured in minutes.